After having Dr. Stanley Krippner on “Shattered Reality Podcast” at the end of July speaking about precognitive dreams amongst other things, I have been mulling over dreams I have had recently. A bit over a week ago I had a dream wherein two people I did not recognize, walked out of a woods toward a road in a place I did not recognize, carrying with them a number of rescued kittens, one of whom was a white female kitten. I was intensely interested in the white kitten and the woman carrying it offered it to me to adopt. I accepted the offer but that is where the dream ended. Several days later, I saw a video on my FaceBook feed from “the Dodo”, which was remarkably like my dream, but minus my participation. I was extremely intrigued by this, though it did not materially affect my life. Something that has become apparent to me recently is that often I dream about people I don’t know or know of, that is they are not famous people. Last night or more precisely in the wee hours of the morning I woke up from my sleep and was thinking about programming a dream. This time I decided to loosely (very loosely, since I was still a bit snoozed) use the technique employed by Dale Graff, a dream researcher and fellow member of IRVA and SSE. I asked for a dream about a future event I might see in the newspaper on the third or fourth page. Sadly in my half snoozed state, I failed to put a date on the newspaper. Sorry Dale, my bad. As planned, I shortly fell back to sleep with my intention in mind. I dreamed I was at a PATH train station in Hoboken NJ going with my class to NYC to the Metropolitan Museum of Art. 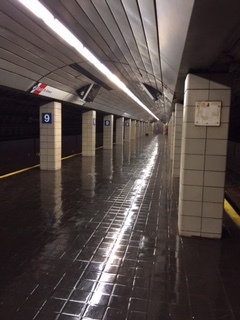 The PATH (Port Authority Trans-Hudson) trains go from urban New Jersey to several locations on the lower westside of Manhattan. Unfortunately the fare had just been raised to $4.00. It is currently $2.75. My entire class went through the turnstile but I did not have exact change, which in my dream had to be in singles and/or quarters. This is at least partially true, because at the Hoboken station, in order to get a one way ticket to insert into the turnstile, you need to put such a combination into the ticket machine. A very thin, odd looking woman, with day-glo red and pink hair that stood up on end, tried to help me. I had put most of the fare into the turnstile but was missing some coins. She stood guard as I ran about frantically looking for change. Amazingly I found that my jacket pocket on the left side was stuffed with $20 bills! How had that happened? I was now afraid of losing them. As I raced back to the turnstile the rooster-haired woman was leaving the station. Someone had just gone through the turnstile that had at least $3.50 of my money in it. Not to be thwarted, I fished a bus ticket out of my wallet and got on the bus for Manhattan bound for the Port Authority Building hoping to catch up with my fellow art students going to the museum. When I got to the Port Authority building I ran into my friend, ESJ, who offered me a flattened but tasty cookie filled with a chewy vanilla marshmallow. It was delicious. Here I will digress. In the past several years I have noticed the ability to smell and taste things in my dreams. I wonder how many people do this? I know studies have been done on who dreams in color versus black and white. For me, it is color, though some dreams have more vivid color than others. The dream concluded with ESJ going to a bakery counter on the second floor of the PA and purchasing piping hot almond biscotti freshly cut and out of the oven. Yum. Apparently I forgot about my class in my delight. When I awoke I had vertigo. I also discovered that the night (09/17/2016) before I had dined at an Italian restaurant in Chelsea around the corner from where a small pressure cooker bomb had exploded an hour after I’d left the restaurant. On the corner near the explosion is a PATH train station which is currently closed over the weekend and I now learn, until further notice. I did not learn of the explosion until today (09/18/2016). In my dream I was at a station on the Jersey side, so this may be entirely coincidental. I will be interested to discover if the PATH train fares increase in the near future. Note: Pay attention to your dreams and journal them. Precognitive dreams can be had by anyone, but you have to respect and remember your dreams and treat them as valuable. Postscript: Yesterday September 29, 2016, there was a terrible train crash in Hoboken NJ. My condolences and deepest sympathies go out to the victims of that crash. The train station and the PATH train are located in the same complex, indeed the track on which the train crashed was the one furthest north and nearest to the PATH train and the PATH train was shut down for several hours yesterday. In addition, money for fixing the trains has been discussed heavily in the local news today. Seems as though the transportation experts had been warning NJ that they needed to make safety changes at the Hoboken station. Did my dream have significant elements in it regarding this tragedy or was it a coincidence? I make no claims and indeed this event is very saddening and sobering. Although I work as an intuitive, I am not an expert in using dreams to forecast things. It is a discipline with which I am working and trying to learn from. If I were remote viewing, I would not have hit a bull’s eye, but probably have been told I went to the right location. 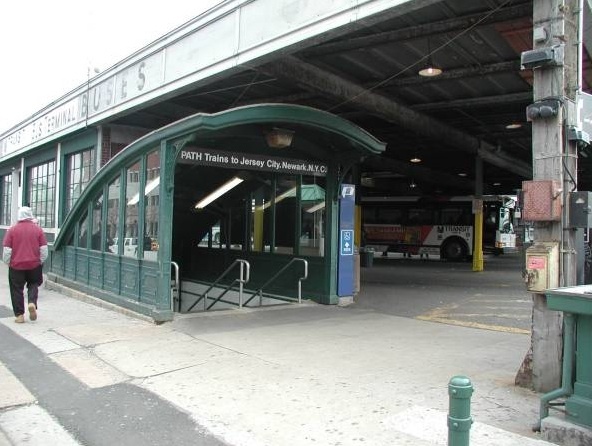 But I put this forth; I don’t ever remember dreaming about going to the Hoboken PATH station before. I have lived most of my life not very far away from it, whether in lower Manhattan or nearby NJ, and in my recollection, nothing anywhere near this significant has happened there or so close by. I do not regularly ride the NJ Transit trains and can’t remember having ever rode on the line that crashed. I now would not be at all surprised if all these fares go up. In a situation like this it is abundantly clear why in remote viewing protocol there are a number of viewers tasked with a target, because different viewers can bring different pieces of the target together. Again, deepest respectful sympathies to all killed, hurt or traumatized by this tragedy. Fahrusha is an intuitive reader and the co-host of “Shattered Reality Podcast”.